As expected, the Indian Railway Catering And Tourism Corporation Limited has launched its Rail Connect app which enables you to book train tickets faster on mobile phones. The app size on the play store is 12 megabytes. Once you install Rail Connect, the application takes about 20 MB storage memory. Options 2 and 3 will take you to the Google Play Store for downloading IRCTC Catering and IRCTC Air apps. If you don’t want to use the food ordering or air transport services, ignore the two options. The 1st option i.e. Train Ticket will let you book a train ticket. How to book a reservation ticket with the app? For booking a ticket, you’ll have to log into the app by entering the IRCTC username and password. Enter the login details and tap on login button. If you’re a new user, tap on register account to join IRCTC website. In case you’ve forgotten the password, the app lets you recover it. The RC app verifies your login credentials and prompts you to enter a 4-digit PIN. Once your PIN for accessing the IRCTC Rail Connect is setup, the app will not prompt you to enter the password. The application remembers your username once you’re logged out of its UI. You’ll have to enter the PIN to book new tickets. Anyway, once the application registers your new PIN, it will take you to the train booking interface. On this interface, you’ll be asked to select the source and destination stations and the journey date. After selecting the source/destination stations and date, tap on the search trains button. If trains are available for the selected date, the app will show them in a list. To see whether the seats are available or not for the given date, tap on the train name. The IRCTC Rail Connect app lets you book train tickets for the sleeper, 2A, or 3A classes. It shows the train’s arrival and departure time and the total travel time. IRCTC Rail Connect application for Android has My Booking section where you can see the tickets booked earlier. It lets you cancel ticket and file TDR through the mobile phone. 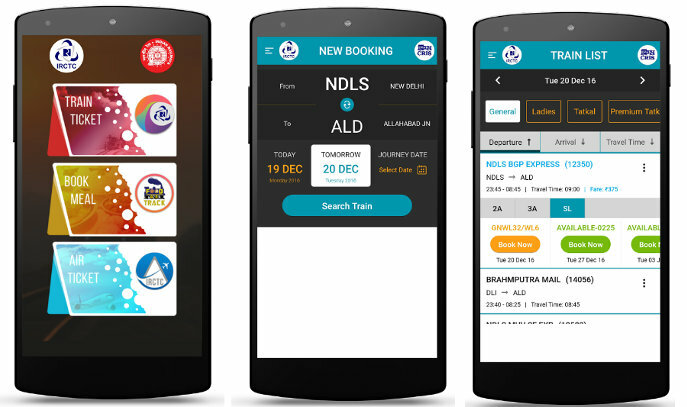 After NTES and UTS On Mobile, the Rail Connect is the 2nd major Android application launched by the IRCTC. By this time, RC has registered 100k downloads. Will it be as popular as the BHIM Money Transfer app? Share your thoughts?